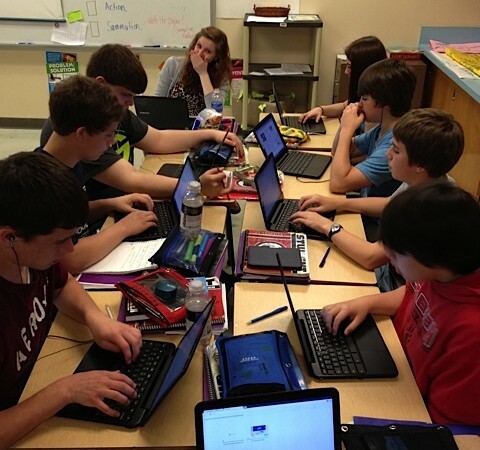 Posted on May 20, 2013	by Picture This Great Teaching	in Middle School, National Education Association	with Comments Off on Kim S.
Technology+conversation=engagement. Students in this photo are analyzing each other’s field note descriptions as part of a Thesis project. This project included the 3C’s-Communication, Collaboration and Critical Thinking while addressing Common Core Standards for writing and research. All made fluid and engaging by the use of Google Chromebooks. The document each student is working on is also shared by the teacher so that there can be constant feedback and formative assessment. Students self-selected topics, help each other, and are engaged in writing narrative, informative and argument sections in this project.